"Your inventions are all lousy! And I thought you were a genius." 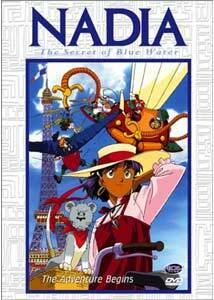 Nadia, The Secret of Blue Water: The Adventure Begins is the first volume in a series of DVD's presenting this 1989 Japanese anime series inspired by Jules Verne's classic speculative fiction novel, 20,000 Leagues Under the Sea. Young, bespectacled inventor Jean first encounters the beautiful Princess Nadia at the Paris World Expo of 1889, where he attempts to rescue her from Señorita Grandis and her henchmen Hanson and Sanson, a trio of scoundrels intent on stealing Nadia's "Blue Water" necklace. In short order, the two find themselves traveling aboard Jean's prototype airplane, an American battleship, and Captain Nemo's Nautilus submarine as they attempt to elude their pursuers and find Nadia's mysterious homeland. The Verne influence is consistently apparent in the art design; Jean and Nadia inhabit a world of amazing bolts-and-steam inventions that lend the show an irresistible air of quaint futurism. Verne's impact on the plot is less direct�while elements of his novel are worked into the story, this is an original, parallel story for the most part. This is probably for the best, as the story of Jean and Nadia is a simple, human tale that should appeal to children and open-minded adults, focusing on friendship and adventure, allowing for some dramatic tension but no truly frightening moments, at least in the four episodes at hand. The animation is of fairly typical late-1980's anime quality, with limited animation and many still images held or scanned under dialogue. Mechanical elements are impressively designed but stiff and awkward in motion; one can't help wondering what computer graphics might have brought to the table had the series been produced today. Still, the visual design is effective, suiting the show's gentle humor and pacing well. The voice acting is consistently good (in Japanese at least), though it's a bit disconcerting to hear King, Nadia's pet lion, grunting and growling in decidedly human-generated tones. The episodes on this disc include #1�Girl at the Eiffel Tower, #2�The Little Fugitive, #3�The Riddle of the Giant Sea Monsters, and #4�Nautilus, The Fantastic Submarine. Most of the action concerns Jean and Nadia getting into trouble, usually at the hands of Ms. Grandis and company, and getting out again with the help of a fantastic conveyance of some sort. Jean and Nadia slowly get to know each other, and Jean vows to help Nadia find her homeland, which she believes is somewhere in Africa. To the show's credit, issues of racism, animal rights and military escalation are touched upon, lending the program some moral substance, though not to the point of preachiness. It's hard to assess the Nadia series as a whole from this vantage point, as the narrative is still getting underway in these four initial episodes. But it's a promising start, with a refreshing, human, mech- and fan service-free approach that's a welcome change from the usual anime production. Image Transfer Review: ADV presents Nadia in its original made-for-television 1.33:1 full-frame aspect ratio, with a decent transfer drawn from broadcast-quality videotape. Edge enhancement consistently rears its ugly head, but the transfer is otherwise solid, with bright color, a stable dual-layer transfer, and enough detail to make cel paint inconsistencies and dust specks from the original production easy to spot. A very nice transfer of this animated television series. Audio Transfer Review: Nadia, The Secret of Blue Water is presented in traditional anime DVD style, with the original Japanese audio and an English dub, both in Dolby Digital 2.0 format. Both audio mixes are heavily centered, with some musical stereo separation but no rear activity whatsoever. Dialogue, sound effects and music are clear enough, though frequency range is limited and the program's 1989 vintage is apparent. As always, the original Japanese track is preferable, with more committed performances from the voice actors; the acting on the English track pales in comparison, especially where Jean's horrendous "French" accent is concerned. Still, it's nice to have the dub for the younger audience this series may appeal to. Extras Review: ADV backs Nadia on DVD with a number of supplements, though most are of minimal value. The disc features 16 chapter stops, 4 per episode, and the disc is structured without between-episode menu stops, an unusual arrangement that makes watching the entire disc in one sitting more convenient. Of course, English subtitles (not "dubtitles") are available for the original Japanese track, with an alternate songs-only subtitle track displaying lyric translations for the otherwise English dub. Extras include textless versions of the program's opening and closing sequences, with credit overlays removed to permit better appreciation of the animation. Two television spots for this volume are included, with a preview trailer for Volume 2, The Dark Kingdom. Rounding out the package are six trailers for other ADV Films DVD releases, including Sakura Wars, Princess Nine, Bubblegum Crisis: Tokyo 2040, Martian Successor Nadesico, Reboot, and Lost Universe. Oddly, these supplements include "English" and "Japanese" audio channels, but both tracks are identical, with music-only or English-dubbed 2.0 audio. Nadia, The Secret of Blue Water gets off to an old-fashioned, adventure-filled start with this debut 4-episode volume. ADV's disc features a competent transfer, though supplements are limited. A definite change of anime pace with a fine sense of design, heavily influenced by the works of Jules Verne.